1 : apply styling cream to wet hair & blow dry. 2 : set hair in pin curls & bangs in a velcro roller. 3 : divide hair into 3 sections, then tease and add hair extension to each teased section. 4 : once hair extension is clipped on, re-peat process to each section. 5 : 3 strips of extensions clips were added to create volume and length. 6 : set with a light hold hair spray. 7 : brush hair half way down from crown smoothing out the curls. 8 : braid side of hair and use bobby pins to secure. 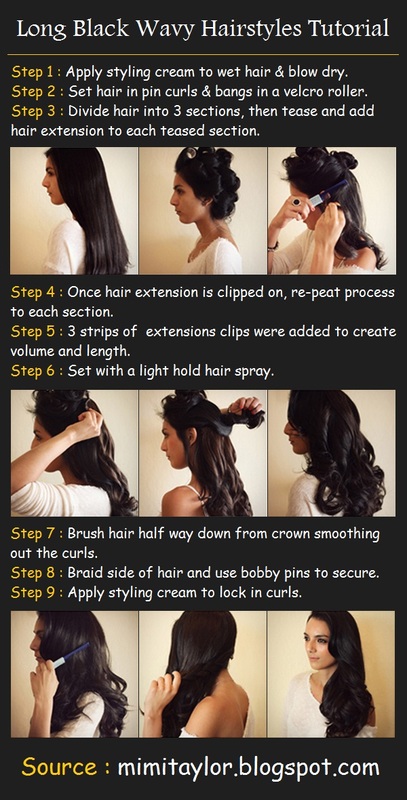 9 : apply styling cream to lock in curls.